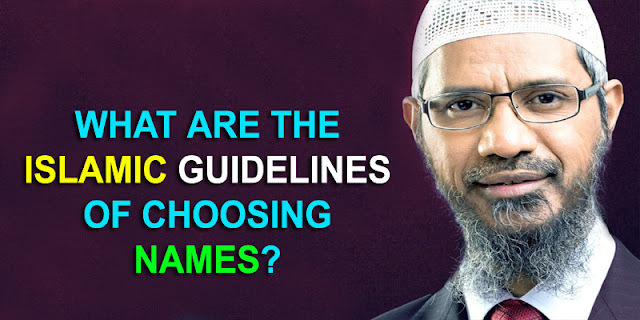 Home / Unlabelled / WHAT ARE THE ISLAMIC GUIDELINES OF CHOOSING NAMES? WHAT ARE THE ISLAMIC GUIDELINES OF CHOOSING NAMES? No doubt the matter of giving names is one of the most important issues in people’s lives because a person’s name is a title which says something about him and is essential for communicating with him. It is an adornment and symbol for the person, by which he is called in this world and in the Hereafter. It is indicative of the religion to which he belongs and makes him feel that he is one of the followers of that religion. It gives an impression of him to other people, and in their view, it is like a garment – if it is too long or too short, it does not look right. - Names of Allaah which are befitting only for Him, may He be glorified, such as al-Khaaliq (the Creator), al-Raaziq (the Provider), al-Rabb (the Lord), al-Rahmaan (the Most Merciful), etc., which are names that befit only Allaah; names which describe attributes which are true only of Allaah, such as Malik al-Mulook (King of kings), al-Qaahir (the Subduer), etc. It is haraam to call people by these names, and they must be changed. Allaah says (interpretation of the meaning): “Do you know of any who is similar to Him?” [Maryam 19:65]. - Names that belong exclusively to the kuffaar and are not used by anyone else, such as ‘Abd al-Maseeh (“slave of the Messiah”), Butrous (Peter), Jurjus (George), and other names which denote religions of kufr. - Names of idols and false gods which are worshipped instead of Allaah, such as naming someone after a devil and so on. It is not permissible to call people after the names referred to above; indeed, doing so is haraam and anyone who has such a name is obliged to change it. 1. Recognizing the fact that this name will stay with the person for his entire lifetime, and it could cause some embarrassment or problems for him which in turn could make him feel badly towards his father, mother or whoever gave him this name. 2. When looking at names in order to choose one, we should look at it from a number of angles. We should look at the name itself, and also think of how it will sound when this person is a child, a youth, an adult, an old man and a father, and how it will suit his father to be called “Abu” (Father of) So and so, and how it will suit his son to be called Son and so son of So and so, etc. 3. Choosing the name is the right of the father, because he is the one after whom the child will be named (son of, or daughter of…). But it is mustahabb for the father to involve the mother in the decision and to ask for her opinion as to whether she thinks the name is good, so that she will feel happy. 4. The child must be named after his father even if the father is deceased or divorced, etc., even if he does not take care of the child or see him at all. It is utterly haraam to name a child after anyone other than his father, except in one case, which is when the child is born as the result of adultery (Allaah forbid). In this case the child should be named after his mother and it is not permissible to name him after his father.